BUMBLE BEE nursing pillow props baby up high on mummy's thighs to make breast-feeding a comfortable and pleasant experience. No more sore and stiff arms! 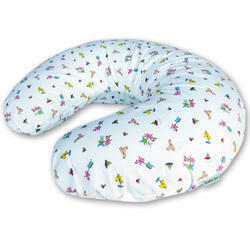 The soft polyester filling makes a cushion too fro baby. Wraps around the waist for secure fit. Machine washable. Daddies benefit too while bottle-feeding. Bumble Bee "Nursing Pillow" in helpful u-shape 20cm thick cushion to wrap around mummy's tummy to support baby when breast-feeding. Cushion is 55cm wide in front. Also helps prop babies up in sitting position.